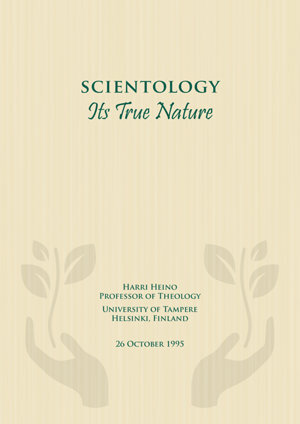 In this article from 1995, Professor Harri Heino considers, in his capacity as a Finnish scholar of religion, whether the Church of Scientology qualifies as a religious denomination. Its true and inherent nature, he unequivocally concludes, is decidedly religious, based on his study of the subject matter as an academic researcher and his observations of Scientology theology, practices and Churches. As he writes, “From all of the above it must be concluded that Scientology in its present form is a religion, offering crucial religious services, a distinctive belief and a tightly organized religious denomination.” Today, over eleven thousand Churches, missions, and affiliated groups exist worldwide, and new Churches are opened on a regular basis in demonstration of the expansion of the Church of Scientology. Harri Heino, Ph.D., (1944–1999) was professor of theology at the University of Tampere, Helsinki, Finland. He was also chief of the Research Centre of the Evangelical Lutheran Church of Finland in his capacity as a Lutheran priest. His numerous publications, in Finnish and English, include Religious Dimensions of Transcendental Meditation (1982); Changes in Religiosity from the Finnish Viewpoint (1988); The Evangelical Lutheran Church in Finland, 1988–1991 (1993); and What Does the Finnish Freemason Believe In? : The Values, Ethics, and Religiosity of Finnish Freemasons (1995).